As promised my first pattern is finished! Liz is another of my simple and rather fast doll projects to make. She comes with changeable clothes and on top of these fabulous features, most of our little ones like playing with, Liz comes with her own little doll. Little voodoo doll. Little voodoo doll is 5 cm (2″) big and goes really nice with little Liz. Pattern is in photo tutorial form you will find together with your Liz doll pattern. I tried to write this pattern with as many details as I could remember, that I found very important for all of you to make exactly the same doll as you can see on above photo. 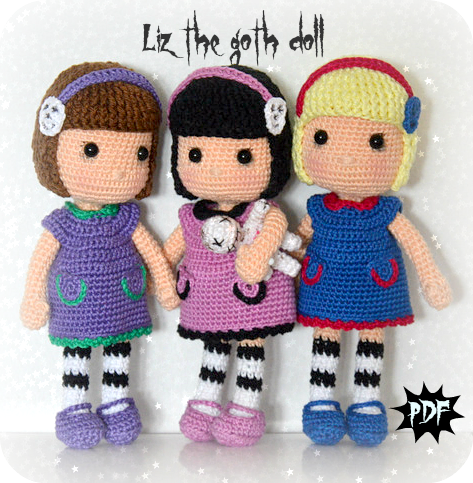 You can make one Liz with different colors, changeable clothes or make many different Liz dolls, each in her own favorite color(s). I am specially proud of doll’s hair style. For a long time I wanted to make this particular style, and I am so happy I succeeded in making one so easy and so lovely, that I really hope you’ll enjoy. And this is not all!! While regular Liz doll is 21 cm (8 inches) tall. This little one, worked in thread and with 1,5 mm hook ended up half original doll size. I smudged and decorated her with crayons, markers and glittering nail polish. I would like to use a chance to announce that I’ll be going to make additional free of charge bonus to this pattern, and it will be the version for long hair, as you can see on little Liz I made for my niece. For that reason I would like to ask everyone who will purchase the pattern, to leave me message with e-mail address where wishes to receive this long hair pattern. The pattern will be finished by Monday, when I will start sending it. Hope you like this little one! Next week starting with one piece doll explained in details and working on new free pattern to share with you soon. Wishing you all wonderful weekend! Omgoodness they’re ALL absolutely adorable, one is just as cute as the next! Awesome job on every one! Love em and can’t wait to buy and make one for my cousins lil girl!